Wexford Motor Club is pleased to announce details of the 2018 Wexford Volkswagen Stages Rally which takes place on Saturday 8th and Sunday 9thof September. We are delighted to have the continuing support of The Riverbank House Hotel and our title sponsors Wexford Volkswagen. The format consists of three stages run three times on Saturday and two stages run three times on Sunday, totalling over 200 Kilometres of both smooth and technical tarmac. Competing cars return to Parc Ferme from 4:00pm Sunday, facilitating any UK crews returning on the evening ferry sailing and competitors travelling a long distance home. As usual, scrutiny will be at Hertz in Ferrybank, Wexford (Y35 C851) from 4:00pm on Friday with central service back at Enniscorthy Mart, Old Dublin Road, Enniscorthy – for both Saturday and Sunday. Rally Headquarters and Parc Ferme is at The Riverbank House Hotel, Wexford (Y35 AH33). This the 47th running of Irelands only two-day non-championship rally. The event has remained free of the constraints of any national championship; status, organiser or sponsor – to evolve into the much celebrated clubman event that it is. The Wexford Volkswagen Stages Rally enjoys a uniquely social ‘International rally weekend’ atmosphere as well as the best value for money and best awards/after party in Irish rallying. Wexford is where UK crews come to compete in all classes with Irish / local competitors – for the bragging rights that last for a full year. Following quite a few years of UK winners, the 2018 Wexford Volkswagen Stages Rally offers an opportunity for an Irish crew to restore the overall award honours. Previous winners include Steve Woods, Mark Straker, James Stafford, Damien Cole, PJ McGrath, Eamonn Boland, Stephen Murphy, Pete Doughty, Donie Keating, Bill Connelly, Frank Meagher, Austin McHale, Bertie Fisher, Ger Buckley and Billy Coleman. The wexfordmotorclub.ie website provides a facility for making a part or full payment of the entry fee. Devised to help keep Clubman rallying, the online payment system allows competitors pay by instalments – with easy to purchase online credits of €10 to €500. The system also provides invoices for crew sponsors or employers when purchasing credits up to a value of €500 each – tax free! Just like the One4all Voucher. Wexford Motor Club is pleased to announce details of the 2017 Wexford Volkswagen Stages Rally which takes place on Saturday 9th and Sunday 10thof September. The event will have 15 competitive stages – a combination of both smooth and technical tarmac. The format will consist of two classic stages run 3 times on Saturday, followed by three brand new stages run three times on Sunday, making a total of over 220 Kilometres. As usual, scrutiny will be at Hertz in Ferrybank and central service will be at the Wexford Racecourse on the Newtown Road. This year we are introducing Niall McCarthy as the new Clerk of the Course. Niall has progressed to the top job having gained 25years experience as an official and organiser of rally events with Wexford Motor Club as well as other clubs. Before that he spent some time as a rear wheel competitor. Niall is supported by an experienced rally organising committee. 2017, year 2 of a 5 year event development programme, sees the launch of a new online payment scheme aimed at helping to keep the Clubman rallying. Competitors can now save and pay for their entries – using easy to purchase online vouchers / coupons on wexfordmotorclub.ie with values ranging from €10 to €500. Needless to say that the online gift of credit towards your entry would make an ideal birthday or early Christmas present, even a special wedding gift!! Competitors can also use this system to enable their sponsors or employers buy vouchers for drivers and co-drivers – up to a value of €500 each – tax free! Just like the One4all Voucher. Chairman of Wexford Motor Club Graham Scallan said we are delighted to be the first motor club in Ireland to launch the new online payments facility for entries into all our motorsport events. With the rise in insurance costs and related costs within the sport, we have launched this new scheme to help members and competitors save and pay for their entry into our events in a more convenient and flexible way, and to help keep the Clubman rallying. Live feeds, interviews and breaking news will be available on various platforms over the rally weekend. This is the 46th running of the event, the 11th consecutive time the HQ has been at the Riverbank House Hotel and the second time to have Volkswagen Ireland and Wexford Volkswagen as the events title sponsors. The gallery of previous winners include Steve Woods, Mark Straker, James Stafford, Damien Cole, PJ McGrath, Eamonn Boland, Stephen Murphy, Pete Doughty, Donie Keating, Bill Connelly, Frank Meagher, Austin McHale, Bertie Fisher, Ger Buckley and Billy Coleman. Wexford Volkswagen Stages Rally would like to acknowledge the generous support of many businesses and organisations, including Wexford’s Local Authorities and Wexford Chamber of Commerce. Wexford Motorclub welcomes competitors from all areas of the tarmacadam rallying world to the Wexford Volkswagen Stages Rally 2017, as our sport enters a very different year for competitors and organising clubs alike. We are pleased that the event has again attracted support Wexford Volkswagen and we are confident both Irish & the UK competitors will support it bigger than ever. This year’s rally will as usual form part of The Suirway Group South East Stages Championship. For 2017 the event is again based at the Riverbank House Hotel. The route is currently in the planning stage and will be available soon. 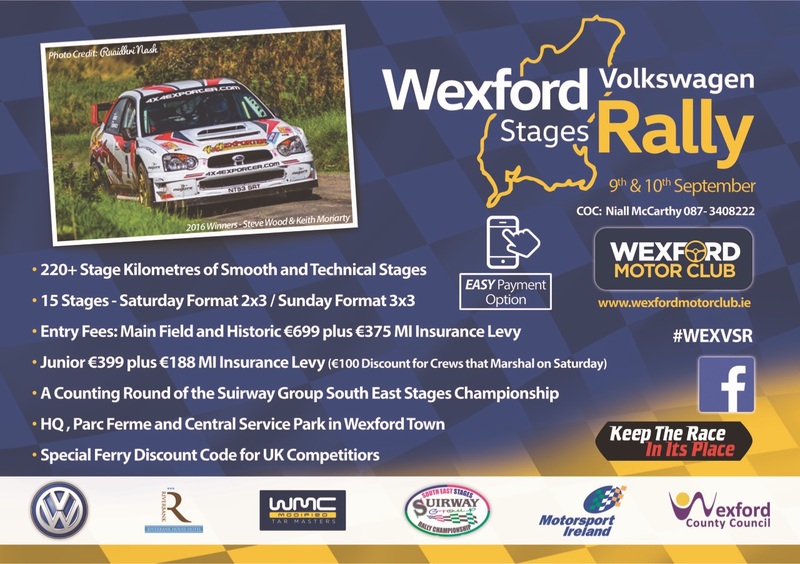 The service area will be in Wexford Racecourse on both days. We look forward to welcoming both old and new competitors to the event and we would like to wish everybody a successful, enjoyable and safe weekend of rallying. Pay For Your Rally Entry In Stages! Wexford Motor Club is delighted to be the first motor club in Ireland to launch a new online payments system for entry into our calendar of motorsport events. With the rise in insurance costs and other costs related to the sport, we have launched this new scheme to help members and competitors to save and pay for entry into our events in a more convenient and flexible way, and to help keep the Clubman rallying. The new online payment facility allows competitors pay for their entries for all Wexford Motor Club Events in stages. You can pay as little as €10 per installment or you can just pay the full entry fee in one go. So for example if you started paying €30 per week now, you could be taking part in our Wexford Volkswagen Stages Rally 2017 in September! An online gift of credit towards your motorsport entry would also make an ideal Valentine’s Day, birthday or Christmas gift, so please make sure to let your loved one know about our new scheme and you may find yourself with a nice surprise! Spectators are asked to listen and to adhere to all instructions and advice given by event marshals. This will ensure a safe and successful event for competitors and spectators alike. Your co-operation is appreciated. The Rally H.Q. is at The Riverbank House Hotel, with signing on starting around 15.00 on Friday 8th December 2017. Wexford Motorclub would like to extend its thanks to all the Marshals, Stage Commanders, Radio Controllers, Radio Crews, Time Keepers, Safety Units and everyone else who give up their time to make the event happen. Without your help, events like this could not run. Thank You for your continued support. If you had thought of becoming involved in motorsport, the best way to do this without the expense of running a car is to marshal. Admittedly, the weather cannot be guaranteed, particularly in Ireland, but you can get a lot of satisfaction by being part of a team of people on a 2 day Tarmac stage rally. As well as general marshalling, which in itself is a vital & valuable role – there are other forms that include Time Keeping, Sector Marshal, Radio crews etc. If you think that this is something you may wish to get more involved with, a good way is to join your local Car or Motor Club or Wexford Motorclub, where you can speak to like minded people who would be only too willing to welcome you, and offer their experience. If you wish to progress further within the sport, our governing body – Motorsport Ireland runs a licensing register of Marshals, that offers a grading scheme which takes you from a Trainee up to a Senior Official/ Organiser level should you. In preparation for this year’s rally, we will need many marshals once again to help with the running of the event. If you are not planning to compete, please consider coming to help marshal, along with your colleagues & fellow club members to run, what we promise will be a challenging route for competitors.